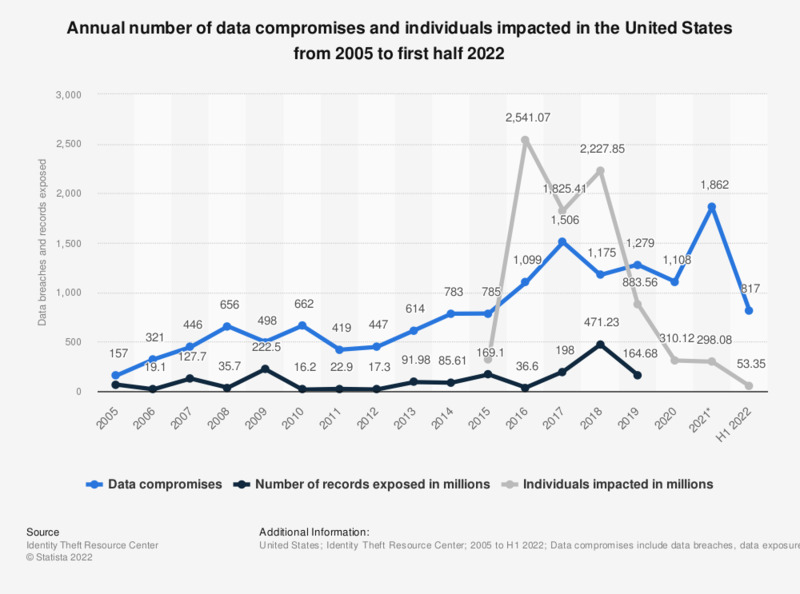 The statistic presents the recorded number of data breaches and records exposed in the United States between 2005 and 2018. In the last measured period, the number of data breaches in the United States amounted to 1,244 with over 446.5 million records exposed. Data breaches have gained attention with the increasing use of digital files and companies and users large reliance on digital data. Even though data breaches happened before digitalization of information – for instance, looking at one’s hard copy of medical files without authorization could be considered a data breach – the popularity of the digital platforms brought data breach to a new dimension as the volume and importance of the data exposed have considerably increased. Worldwide, identity theft is the most common type of data breach incident, accounting for 59 percent of all global data breach incidents in 2016. The largest data breach to date was uncovered in 2016, as online platform Yahoo announced hackers stole user information associated with at least 1 billion accounts in 2013. Another Yahoo hack was uncovered only a few months earlier, revealing 500 million compromised data records. The number of data breaches and the number of exposed records in the U.S. have reached the highest figures to date in 2017. Nearly 179 million records were exposed in the U.S. in 2017, whereas the number of data breaches in the country added up to 1,579 that year. The business sector was the most affected by data theft as this particular sector accounted for nearly 91.3 percent of all exposed records in 2017. In terms of loss in the United States, cyber crimes have the highest average annual costs for the financial services industry. Cyber crimes caused an average loss of 28 million U.S. dollars in this sector during the 2015 financial year. Viruses, worms, Trojans and malware are the most common types of cyber attacks experienced by American companies. Just over half of the companies in the U.S. stated having experienced malicious insiders, the type of cyber attack that takes the longer to be solved – an average of 68.9 days.